Mt. Assiniboine. A place I have googled and researched for a few years, after first seeing photos from this majestic part of the Canadian Rockies by the likes of Jason Edlund, Koveh Tavakkol, and Kevin McNeal. I’m not sure how many times I have talked about this place to my wife, Anna, over the last few years. But I think it’s fair to say she got the hint on how much I fell in love with this place, from simply admiring photographs. So when I turned 30 this year in May, part of her gift to me was a helicopter flight into Mt. Assiniboine for the early part of September. We scheduled the flight so it coincided with my time off from work, so I wouldn’t have to take any extra time off. I could have hiked in, but would of had way less time to spend there, as I had to go back to work on the 12th. I would have preferred to head down there in late September/early October, but that was just to close to our wedding date of October 5th. While I thought about cancelling the trip multiple times because it was so close to our wedding date, Anna assured me that she would take care of all the last remaining wedding details, and that I should just go see the place I had been talking about so much, but to make sure I brought back some great photos. I convinced my good friend Nick to come along as well and after shuffling flights around we finally got on the same flight together. Having never been on a helicopter before, I was pretty excited the day we drove towards Mt. Shark (one of the launch sites) We watched a couple of flights before us and then it was our turn. Jumped in the chopper, buckled in, and we were on our way. What an awesome way to experience the Rockies! I didn’t take any photos from the air heading to the Assiniboine Lodge, but I was lucky enough to get some awesome shots of the Spray Lakes Reservoir on our return flight (coming in a later blog post). We ended up staying at the Magog campground which is about a 1/2 hour walk from the lodge. It cost us $10 per person, per night. I think next time we will stay in the huts though, because it’s only an extra $5 per person, per night to stay in much more comfortable accommodations. And they are also a lot closer to the lodge and “happy hour”! The first night it rained pretty good so I don’t have any shots from sunset. And the next morning was extremely foggy. I took a few photos, but I am sitting on them for now, deciding which ones are worth going up on the website. What I really wanted to do was show these four images, because I think it is so cool how each photo has a different mood to them, but is generally the same composition. We almost missed all this light because of “happy hour”. It was quite the hike up the steep path to the Niblet after consuming a few beverages and lugging up the camera gear! I’m not one to stop for breaks and much to the surprise of Nick, I needed a few! Next time I go here, I plan on taking a larger panorama from higher up. One thing to note, it was incredibly windy up here and thank goodness it was blowing me towards the hill and not over the edge, haha. I loved watching the moon track across the sky as well, it’s too bad in the third photo it was hiding behind the clouds. So what do you all think, which photo is your favorite and why? I still cant decide between these four which one I like best! If anyone wishes to purchase a photo, there is a link below each to purchase. All proceeds go to making sure I can go out and take more photos such as these! 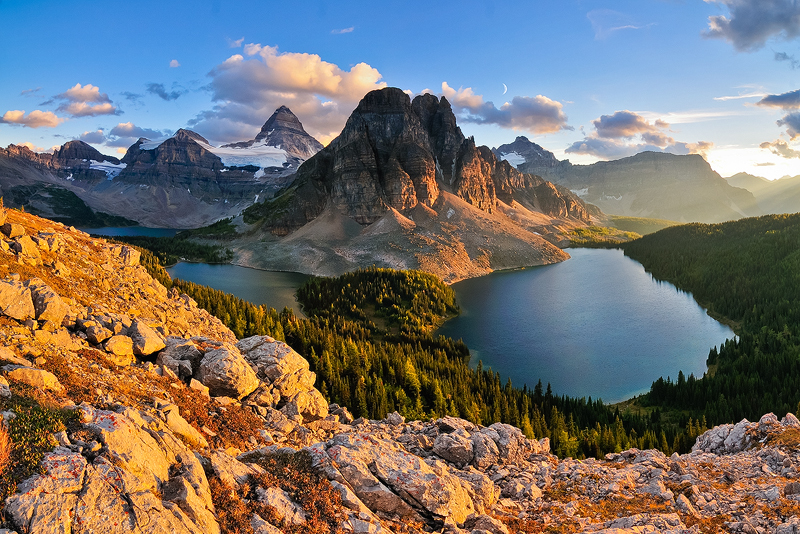 “Golden” Mt Assiniboine, British Columbia. “Lit Up” Mt Assiniboine, British Columbia. 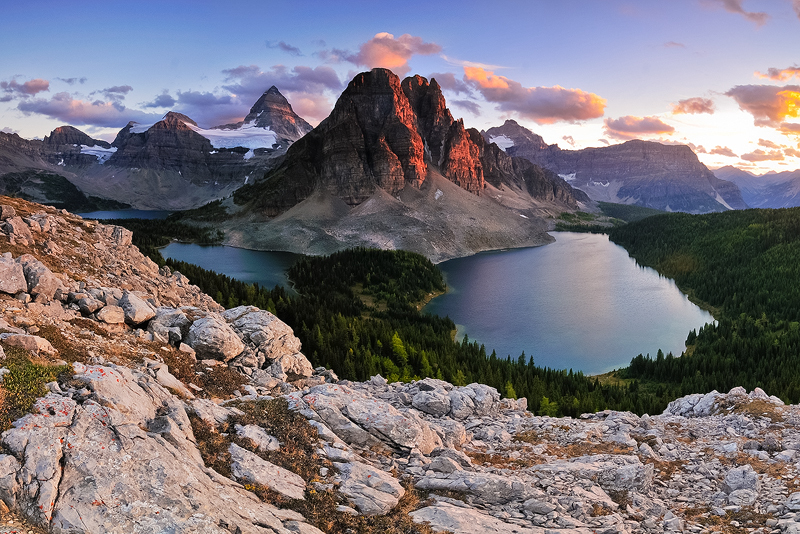 “Hide and Seek” Mt Assiniboine, British Columbia. 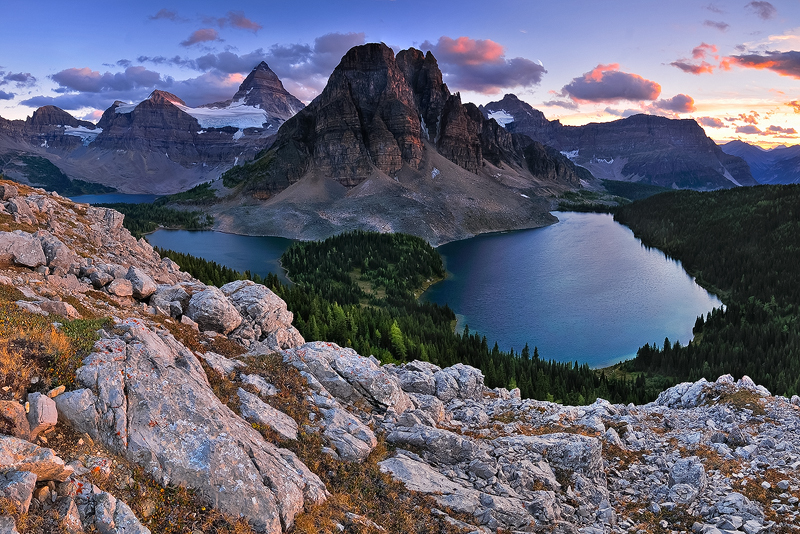 “Last Look” Mt Assiniboine, British Columbia. Written by Mike Isaak, posted on October 19, 2013 at 11:48 am, in BC, Mt. 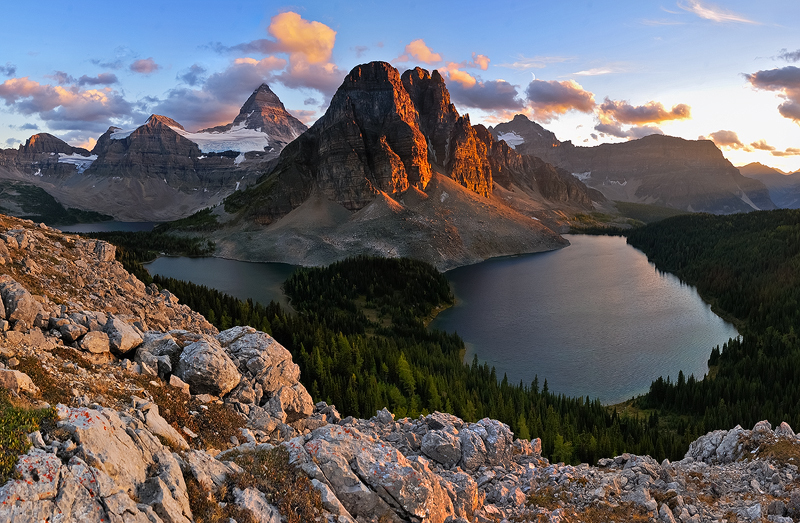 Assiniboine, Travel and tagged bc, british columbia, canada, mt assiniboine, sunset, travel photography. Permalink. RSS feed for this post. « Aurora Chasing Oct 8-9th – Edmonton, Alberta. Hey Mike – did you do any editing on these photos, or are these the original takes? I’m following your blog and am finding your descriptions about how you came up with the photos particularly helpful. Hello Susan. First of all, welcome to the blog and thanks for taking the time to write down your questions! For all four of these photos, they are multiple image photographs. They are essentially stitched panoramic photos, but I cropped them to a 2:3 aspect ratio. They are also bracketed exposures. So basically what I did in the field was, set up my camera in portrait orientation (vertical) and then proceeded to quickly fire off shots at -1EV, 0EV, and +1EV and then pan the camera over. Each one of these 4 photographs consists of over 20 images, which I stitched together using AutoPano Pro. From there it was basically a little bit of dodging and burning just to make sure everything was exposed the way I wanted it to be. I hope that answers some of your questions! In the second mood，the rock take too much space of the photo. The plain light on this rocks makes this foreground a meaningless part of the whole photo.